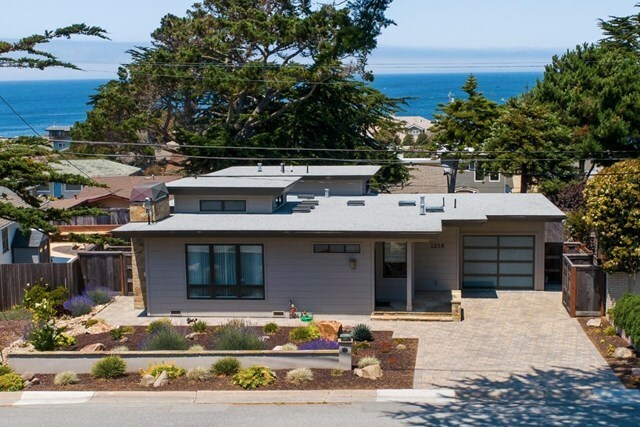 This Pacific Grove mid-century modern defines the terms quality and elegance. Three bedrooms and three full baths, this single-story fully renovated home was the winner of the 2015 Heritage House bronze plaque and designed by one of PG's finest architects. Its not often that you will find this type of workmanship in a home. Every detail has been well thought out so that one can enjoy a comfortable, coastal lifestyle. Large windows and multiple skylights add ample natural light. Warm custom maple cabinets and built-ins throughout accent the white oak hardwood floors, premium carpet and ceramic floor tiles. Bay views from many rooms, chefs kitchen with bright clerestory windows, high efficiency appliances & lighting are just a few features that enhance the clean tasteful lines. Finished garage and lower level room add ample storage possibilities. Beautiful low maintenance and drought resistant succulent garden with fully fenced rear yard. The custom features this home offers are endless.